I have always wanted to build a working model of our solar system (often called an Orrery) but was never able to find a design or set of plans that inspired me. Having never worked with gears, I believed that designing my own was far beyond my skill level, but that’s never stopped me before. I began reading books and articles about gears and researching the exact orbital periods of our moon and planets. 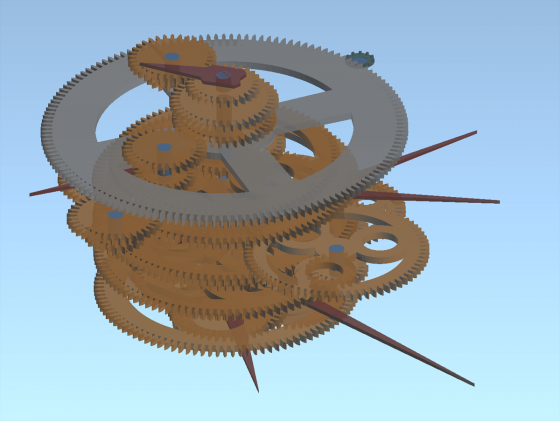 Then quite accidentally I found a program called Gearotic Motion that allowed me to design and arrange gears interactively. Three months later I had come up with a design that inspired me. The model contains 30 gears and is driven by the small crank at the bottom. One full turn of the crank advances the Orrery by 14 days. The moon and all of the planets will then revolve around the sun in proportion to the way they move in our solar system. The gears are epycycloidal and Modulus 1, designed to provide a maximum error of 0.5% or less. The actual errors are shown in the table below. While it is possible to create an Orrery with little or no error, that would have greatly complicated the design and I didn’t deem it necessary for a project of this type. The concept drawing was done using 3DS MAX, a 3D modeling program. This is very different than a CAD drawing with exacting dimensions and assembly details (for that, I was going to need help). I posted my concept model in a metal working forum and soon found David, an experienced NASA machinist who wanted to work with me to bring the concept to reality. David’s understanding of machining and mechanical engineering were a tremendous help in figuring out how to actually assemble the model and make it work. We each built our own models with different stylistic choices, but we constantly shared our ideas, successes and failures. Once the design was completed I spent seven months machining the Orrery, filming each step in the process. The following pages contain detailed videos of how I built my Orrery. All of the videos were shot in HD, so feel free to expand them to full screen mode while watching them. I have provided a PDF containing my 3D model of the orrery which can be downloaded here (right click on the link and choose “Save As…”). A detailed description of the PDF is contained in the Orrery Plans video below. Additionally, the Gearotic Motion Version 1 project file is available here (right click on the link and choose “Save As…”). You can download a free demo of Gearotic Motion to view the file. 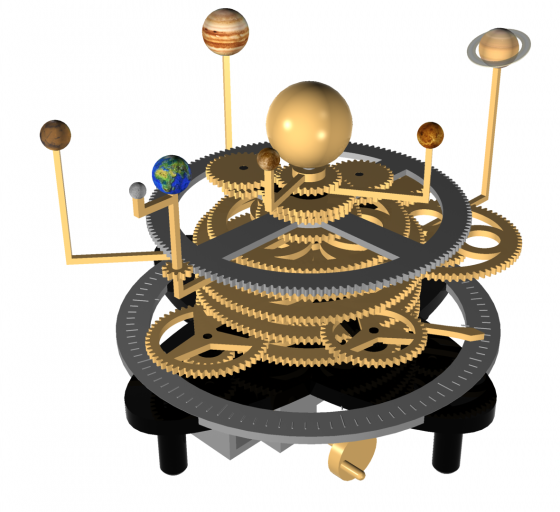 Please note that the latest version of Gearotic will not read the Version 1 project file, but a simple workaround is explained in the Orrery Plans video below. The project file contains all of the gear specifications and clearly shows the arrangement of the gears. The details for making the gears and connecting them to one another are shown in the videos on the following pages.